It’s become a tradition here on this site to write about New Years’ Glasses, and this year does not disappoint. My favorite, above, is a set of “2010″ glasses where they’ve added an 8 above the last digit. You could have used one of the TWO circles in the numeral 8 to look through, but, no. The eight goes above the 2010. Goodbye 20179 A.D., welcome 20180 A.D. These glasses miss the mark as well, inserting a hole into the 1 in 2018, seemingly unaware of the context of utilizing an existing hole in a number to look through. 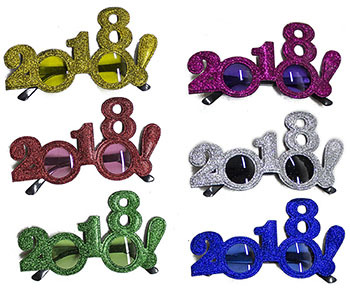 And these glasses, bizarrely, dispense with the whole number-lense thing, floating “2018″ over a 3d-glasses template, and then covering the whole thing in glitter. I posted these on New Year’s Eve, so you couldn’t buy them in time. I know some of you guys are out there buying the stuff I post. Don’t.